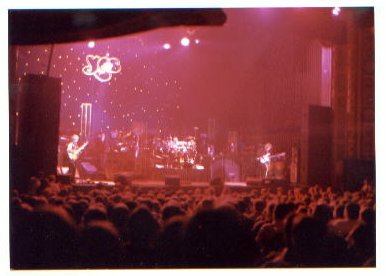 To those of you who aren't sure if you want to see this tour...if you are enamored by the musice of Yes, then you should not do yourself the injustice of missing this. The band is at their very best. They are performing with even greater skill and mastery than 25 years ago. The music they are including is classic Yes. Last evening I was seemingly transported to a time and place many years previous and if I closed my eyes, it was as if I was 18 again and they were on a tour from the late 70's. The same magic permeated the theater. The orchestra was incredible. They added a rich depth to many of the songs with orchestrations that enhanced the soaring epic compositions. We even caught the conductor clapping with the audience on a few occasions when the orchestra had a rest. It appeared as though he really was enjoying the evening. 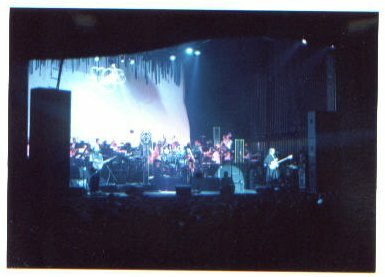 My 17 year old son is a percussionist and this was his first Yes concert. He has been listening to Yes for years and finally was able to attend. It won't be his last. To those who we chatted with at the brewery before the show...thanks for sharing the warm memories. It was the perfect place for us to relax beforehand. I wonder if anyone else noticed the large photos on the wall near the billiard tables? They looked like something Roger Dean would do. Very fun. To those of you who hold tickets...you are in for the show of your lives! Thank you so much. It's great to be with you once more, really, amazing. It's really warm. How do you do it? I don't know. Last time we were here it was really freezing! So, sort it out. We'd like to do a couple of new songs, we've got an album coming out in about a month or so. It's very interesting, ahh, we love the album, of course and ahh, it's called 'Magnification' as we magnify everybody around us and everything around us, so we magnify ourselves. Here's a song, ahh, the first of two songs, this is out of tune (strums guitar). But I was playing the wrong chord. Anyway, tuning up. This song is called 'Don't Go' is the song. Thank you. That was a song about how you shouldn't take love for granted, and that was the idea of the song. Just a track on it. On the album there are a lot of different kind of things going on this time. In fact one of the wonderful moments that we had was just one day around eleven, we started work in the studio, Alan started playing piano and this song came out in the process. Thank you. Thank you so much. I'd like to introduce you to this wonderful symphony orchestra here with Bill. Bill Straumburg, our conductor. [???] 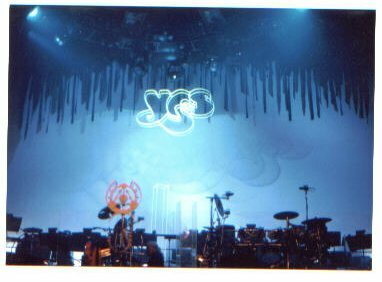 So, we decided to jump into the realm of Yes music that had sort of deep feelings and sort of an adventure every night, so tonight is no exception. We give you a song called 'Gates Of Delirium'. Thank you so much. Thank you. You're most wonderful for listening. Thank you. The power of you listening that makes us try to play better. Thank you. I'd like to leave you in the capable hands, fingers and wonderful guitar styles of Mr. Steve Howe! We wrote a song, ahh, one morning when we were up in Switzerland making an album. Years, twenty years, a long time ago. A long time ago. We'd like to play it for you tonight. It's a little song called, ahh, 'Wondrous Stories'. Thank you so much. Thank you. Thank you. Thank you. It is kind of amazing to play that piece of music, I think we wrote it twenty, thirty years ago. Thank you for listening. Here's a song we always enjoy playing. We haven't played it for a couple of tours, but we're going to play it for you tonight. Any requests? Thank you so much. Thank you. Thank you so much. Thank you for listening. Your energy's wonderful. Thank you. Thank you. I'm just so, I'm so blessed and so lucky. I have the most wonderful lady with me all the time, my soul mate, Jane. And ahh, this is a dedication to her. She plays this song at home all the time and it's just so wonderful that she loves this piece of music. It's called 'Ritual'. Wooh! We'd like to thank again the symphony orchestra with Bill Straumburg here. Thank you. We'd also like to thank our wonderful keyboard player, Mr. Tom Brislin over here. And last, but not least, Chris Squire on bass guitar! And on the drums, on the battery, Mr. Alan White! If you'd like to sing along with this song, we'll have everybody up and dancing, like you can only dance here [??? ], dance like this, just like this. Thank you so much. Any requests?